Cowley State Fishing Lake - photo by Jim Mason Cowley State Fishing Lake attracts wildlife from the surrounding tallgrass prairie. Upland sandpipers, common nighthawks, and eastern meadowlarks are common throughout the summer. The trees surrounding the lake attract migrating songbirds as well as a few nesters, including northern orioles, kingbirds, robins, and mourning doves. Collared lizards, slender glass lizards, and tarantulas are frequently found around the exposed limestone boulders, and occasionally you may be surprised by a venomous copperhead. For naturalists, the area is most attractive for its spectacular wildflower blooms. In spring look for rose verbena, prairie spiderwort, large-flowered penstemon, ground-plum, and Oklahoma phlox. Kaw Wildlife Area, located just a few miles west of Cowley Lake, often produces some unexpected finds. For an interesting drive to several good wildlife spots, travel 6.4 miles west of Cowley State Fishing Lake on U.S. 166 to Cowley County 1 (Red Arrow). Turn south and head toward Silverdale. Along the road look for loggerhead shrikes, scissor-tailed flycatchers, and dickcissels. This area also harbors one of the largest populations of bobcats in the state, although they are rarely seen. Just south of Silverdale, alfalfa fields flank both sides of the road. In late April and early May, bobolinks are frequently found here. Two bridges span Grouse Creek and both sites are marked as parts of Kaw Wildlife Area. In spring these riparian woodlands are full of warblers, vireos, and flycatchers. A rock road heads west 1.3 miles south of Silverdale; follow this road through blackjack and post oak country for 3.3 miles. Watch for white-tailed deer and wild turkeys. During spring, the night woods are alive with the calls of chuck-will's-widows. Across the road from Horizon United Methodist Center (Blue Arrow) is a second-growth woodland that usually has singing painted buntings, indigo buntings, and blue grosbeaks in late April and May. This is private property, but the birds can usually be seen and heard from the road. Cowley County 6 is at the stop sign another mile north of Camp Horizon. Two miles west is another entrance to Kaw Wildlife Area (Green Arrow). Here the Arkansas River can be scanned for wintering bald eagles or springtime ducks and shorebirds. Picnic tables, Grills, Pit toilets, Boat ramp. Directions: From Arkansas City (50 miles south of Wichita) travel 13 miles east on U.S. 166. 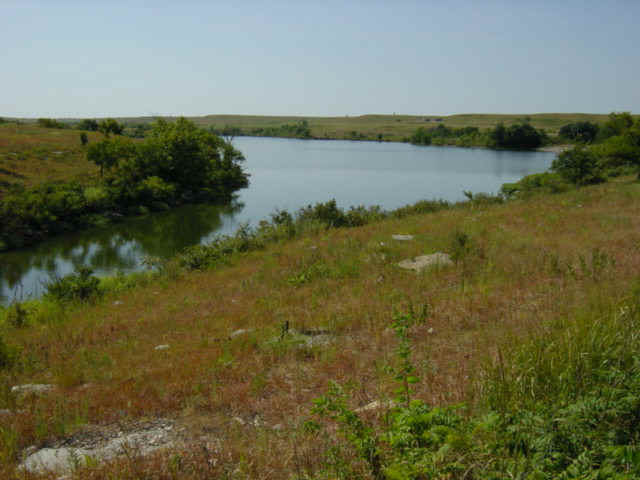 You can download brochures on Cowley State Fishing Lake and Kaw Wildlife Area from the KDWPT web site.